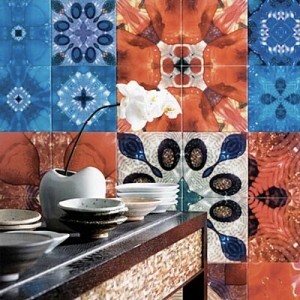 Tiles come in so many materials, colors, shapes and designs that choosing just one is not easy! Unlike other items I have written about on this blog (wallpaper borders, metal wall art), gorgeous design is abundant here, and once you start browsing around, you wish you had many more spaces for tiles in your home. 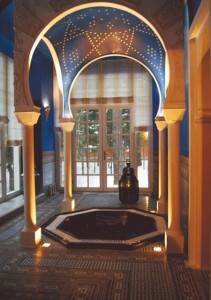 I love the look of them everywhere: as floors, on walls and furniture, in pools, as accent pieces in outdoor areas, etc. 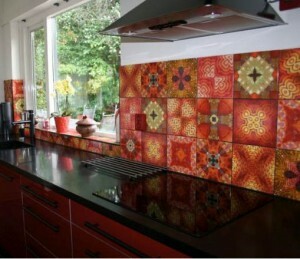 The only thing I dislike about them is how consuming it is to clean the grout. And it eventually needs replacing. I prefer to use non-toxic cleaners, and have found vinegar and hydrogen peroxide (not together) to be the best options. But you still have to scrub with a toothbrush to get it somewhat clean – and it’s still not squeaky clean enough for my taste. I recently found out about a product called SaniGlaze, which apparently extracts all the mold and dirt your tiles and grout have absorbed over the years, and then covers it with a clear sealant which lasts forever and all you have to do to clean it is wipe that surface off. Sounds like a dream; I may have to try that for our bathroom floor. 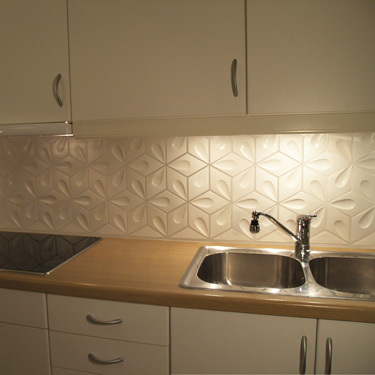 It’s really cute with small, white hexagonal tiles, but it is a nightmare to keep clean. 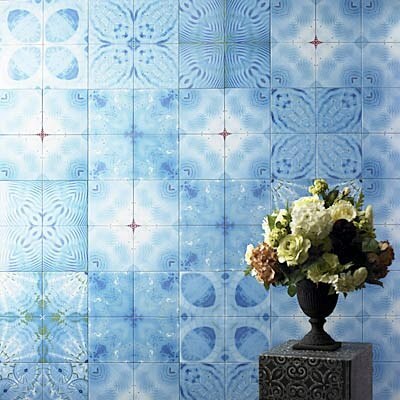 The tiles from British designer Dominic Crinson are gorgeous, but not for the faint of heart. Most have really vibrant colors and patterns, and some are even a tad strange. If you love the colors but can’t imagine living with an entire wall of them, just put up a few, as wall decor accent pieces. 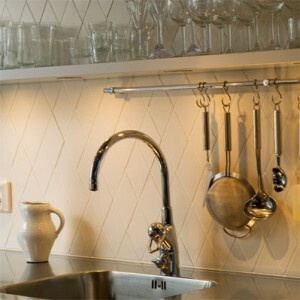 The “drop” tiles from Swedish design team Jenny Oldsjö and Ragnar Hultgren are white, understated and very Scandinavian-looking. 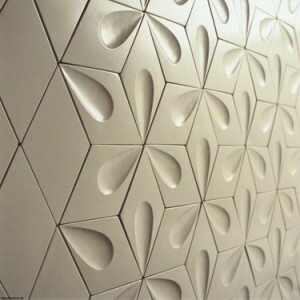 They are made from an interesting material I had never heard of before: soft concrete. It is made by adding a little bit of polymer to the concrete, making it softer and more elastic. I love concrete (my sister-in-law has a gorgeous concrete kitchen counter top in her house which I just adore) but sometimes it feels a little bit cold and hard for indoor use. Well, that just got solved here. The polymer not only makes it softer, it also makes it warmer and quieter. 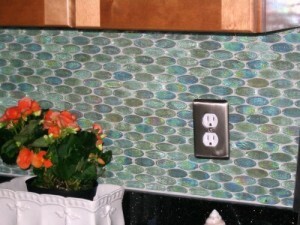 It can be used as a backsplash, kitchen counter, bathroom wall, floor, etc. – and looks gorgeous everywhere. I have always loved the Moroccan look – those Moorish arches, heavy upholstery fabric, rich color schemes, ornate lanterns, and of course, the tile work – both the ceramic and mosaic tiles are amazing. Carocim founder Christian Berthéas feels the same way. 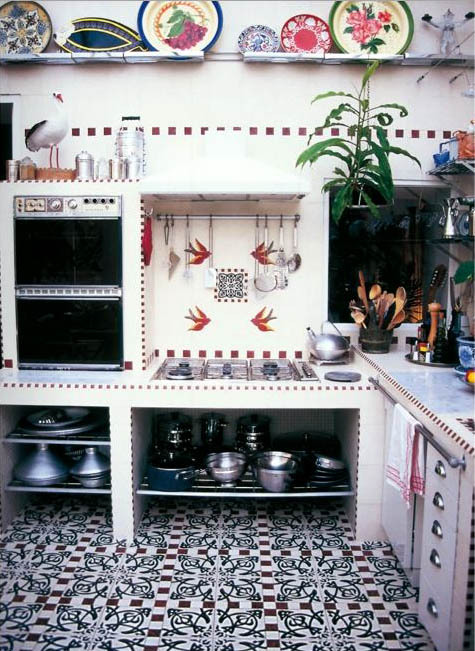 While spending some time in Marrakech in the early 1980s, he became enamored with the tile work he saw everywhere, and when he returned to France in 1986, he started Carocim. Here are some images from their latest catalog (the first one is not a kitchen, I know, but I couldn’t resist it, it is just too gorgeous!). 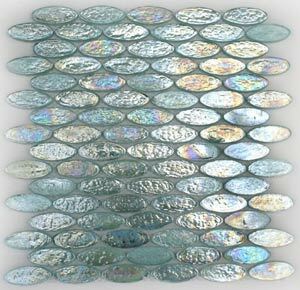 These oval iridescent glass tiles from mosaic artist Susan Jablon are simply stunning. All her designs are fabulous, but this is one of my favorites. The color, the shape, the glow – just perfect. I also love her background – a success story many of us dream of for ourselves. After spending many years in the corporate world, she decided (in the late 90s) to take a chance and follow her heart and return to art. She opened her tile business in 2000 and it was an instant success. 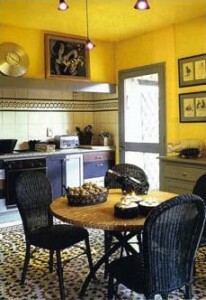 She has since been featured on shows like Hell’s Kitchen and Trading Spaces, and needless to say, business is booming.